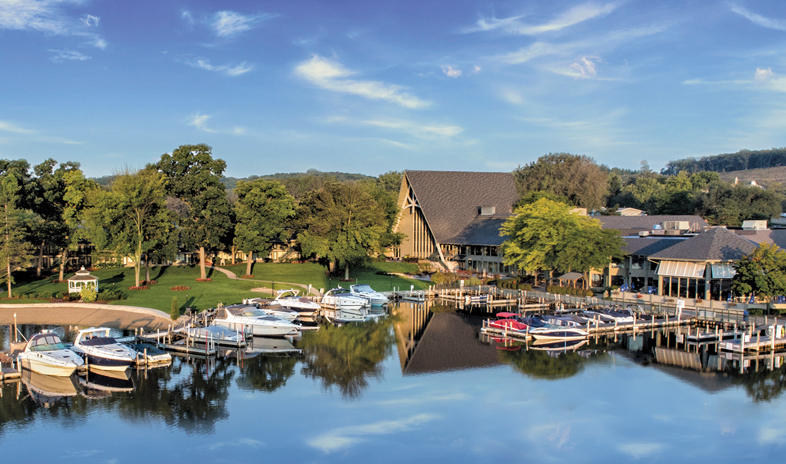 The Abbey Resort claims 90 acres on Wisconsin's Lake Geneva, just 50 miles from Milwaukee and 80 miles from downtown Chicago. Guests enjoy the results of a recent two-year, multimillion-dollar renovation. The project updated everything from the 334 luxury accommodations to the five food and beverage outlets, 35,000-square-foot spa, and 40,000 square feet of indoor-outdoor event spaces. Groups meet in an eight-room conference center, two ballrooms, and seven additional rooms. Outside, they gather on the harbor lawn and for cruises on the lake. While some recharge their energy at the spa, fitness center, or atrium pool, others go for boating on the lake, hiking in the woods, or golf at nearby courses. Snow time brings skiing to the area, snowshoeing, sledding, and ice-skating at The Abbey's on-site rink. A reported 46% of U.S. businesses are utilizing incentive travel and spending $22.5 billion annually on programs to reward employees (Incentive Research Foundation). And while the Caribbean remains the most sought-after destinations for travel rewards programs, planners are feeling pressure to do more with the same budgets and are finding travel abroad to be increasingly more difficult (Successful Meetings). As the cost of travel steadily increases and incentive program budgets stay level, The Abbey Resort invites companies, associations, and organizations with incentive travel programs to look stateside for a relaxing, wellness-inducing travel reward program at The Abbey Resort and Avani Spa. Located directly on the shores of beautiful Geneva Lake, just 80-miles from downtown Chicago and less than a one-hour drive from Milwaukee, The Abbey Resort is easily accessible from both markets granting companies significant savings on the cost of air travel. For decades, leisure guests have been choosing The Abbey Resort and Avani Spa for beauty, relaxation, adventure, and lasting memories. With its picturesque harbor views, award-winning restaurants featuring live music on the weekends, and luxuriously appointed guest rooms, The Abbey Resort and Avani Spa is an ideal destination for employees to be rewarded, rejuvenated, and pampered. Employees will feel rejuvenated after spending time at the lake and enjoying a variety of activities including hiking, biking, disc golf, and water sports such as boating, kayaking, and paddle boarding. If kicking back is what they seek, employees will feel refreshed after relaxing on the beach, taking a dip in the pool, or enjoying a treatment at the recently renovated Avani Spa which features an indoor sunlit atrium pool, whirlpools, dry saunas, steam and inhalation rooms, and poolside food and beverage service. Avani Spa features a complete menu of spa treatments and salon services, ranging from traditional massages and facials to unique wraps and scrubs, which can be incorporated into incentive travel programs for additional employee incentive. With impeccable customer service, the team at The Abbey Resort consistently meets the needs and expectations of meeting and travel planners as well as its guests. As one of the few resorts in the Midwest with its own staff of meetings planners, The Abbey’s team is capable of customizing incentive travel programs to fit each planner’s and organization’s objectives. For more information about meetings and events at The Abbey Resort, or to begin a customized incentive travel program partnership, please visit http://www.theabbeyresort.com/meetings-events or contact the Group Sales department at 1-800-709-1323. The Abbey Resort and Avani Spa is managed and operated by Hostmark Hospitality Group of Schaumburg, Ill. For more information or reservations, visit www.theabbeyresort.com, join Abbey Resort and Avani Spa on Facebook https://www.facebook.com/abbeyresort or follow @AbbeyResort on Twitter www.Twitter.com/abbeyresort. FONTANA, Wis. – November 5, 2015 – Guests are invited to drift away from the ordinary and experience the excitement and exhilaration of a snow day once again through seasonal and holiday programming at The Abbey Resort. Harbor-side ice-skating, cross-country skiing, and crackling yuletide bonfires are among the seasonal activities featured in The Abbey’s recently released winter video (viewable here: https://www.youtube.com/watch?v=Zq9czU5e6mU ). Lasting memories and traditions await families and couples alike at The Abbey this season! Guests are invited to make every day a snow day, twirling to their hearts’ delight on the harbor-side ice rink, building snowmen on the harbor lawn, hiking or racing through a winter wonderland on snow shoes or cross country skis, and warming up with cocoa by the cracking fire in the lobby’s stone fireplace. At night, guests can head back outside to a yuletide bonfire complete with s’mores and cider, or cozy up with loved ones over a favorite board game, knowing that the next morning brings another day of non-stop snow day fun. Additionally, a stay at The Abbey offers access to traditional Lake Geneva activities such as shopping, sight-seeing, and adventures like sledding, downhill skiing, snow-biking, and winter zip-lining. For those looking to relax in addition to the fun and adventure on their snow day getaway, the Thrill and Chill package is perfect, including: Overnight accommodations; One Zip Line or Canopy Tour per guest; A buy-one-get-one-free day pass to Avani Spa, and; An Avani Spa service discount. The Winter Break at the Lake package is a great option for families, including food and beverage credit and arcade tokens in addition to overnight accommodations. The longer a family stays, the more they save and the more credit they earn. A 2-night package starts at $279 and includes $50 of food and beverage credit and $20 of arcade tokens, while a 5-night stay starts at just $579 and includes $125 of food and beverage credit and $50 of arcade tokens to keep the little ones happy throughout their stay! The holiday season kicks off at The Abbey with a full lineup of Thanksgiving programming that couples and families alike are sure to enjoy! Thanksgiving week will feature specials at Avani Spa including a Pumpkin Spice Massage and an Autumn Mist Mani & Pedi; Bears-Packers trivia; Turkey cookie decorating; Flag football tournaments; Thanksgiving crafts such as pinecone turkeys and beaded corn, and; A Turkey Trot Bonfire featuring salted caramel s’mores and hot apple cider. And of course, a complete gourmet Turkey dinner buffet will be offered at the resort’s award-winning 240° West restaurant. Following Thanksgiving, The Abbey transforms into a winter wonderland of holiday cheer! The annual Christmas Tree Lighting, which is open to the community, is scheduled for 6 p.m. on Saturday, November 28 just outside the historic Abbey A-frame. The event will feature Christmas music from the Lake Geneva Symphony Orchestra Ensemble, festive refreshments, and a visit from Santa Claus who will select one lucky child to pull the switch to light The Abbey Christmas Tree! The four weekends leading up to Christmas are bursting with the magic of the season, featuring holiday activities such as: Christmas movies in the resort’s on-site theater; Santa’s Workshop crafts for all ages; A Holly Jolly Christmas Carnival of games, activities and crafts including cookie and gingerbread house decorating; Yuletide Bonfires on the harbor patio with s’mores and cider, and; Visits from Jolly Old St. Nicholas himself, including Brunch with Santa offered every Sunday from 9 a.m. to 1 p.m. in 240° West, $27.95 for adults and $12.95 for kids. Christmas programming continues from Sunday, December 20 through Christmas Day on Friday, December 25 with even more games, activities, crafts and cheer scheduled from 8 a.m. until 10 p.m. each and every day, including stocking decorating, making treats for Santa and his Elves, and a special LEGO workshop, compliments of Santa, on Christmas day. Following Christmas, The Abbey is aglow with seasonal magic during Glow Week lasting December 26 – 31! Glow Week is the perfect way to add energy and excitement to the stillness between Christmas and New Year’s Day. Glow Week at The Abbey will feature black lights, glowing bouncy balls, warm and bright bonfires, neon nails and face paint, glow-in-the-dark pool parties, and a special Neon Night full of light-up fun for all ages! New Year’s Eve brings yet another chance to celebrate at The Abbey for kids, adults, and families. A uniquely kid-friendly option, The Abbey’s New Year’s Eve Half Night of Fun is designed for kids ages 4 – 12 and allows parents to enjoy dinner on their own in full confidence that the kids are having a blast at their own party featuring dinner, games, and activities led by The Abbey’s dedicated “Agents of Fun” staff. The New Year’s Eve Breakaway Bash For Families allows families to ring in the new year together in an open-house format featuring music, dancing, a photo booth, and a glow-in the-dark celebration culminating with The Abbey Ball Drop featured harbor-side at midnight. For complete details about winter and holiday activities, packages, and rates or to book a stay, please visit http://www.theabbeyresort.com/special-pkg/seasonal-specials.aspx or call 1-800-709-1323. FONTANA, Wis. – October 19, 2015 – The Abbey Resort and Avani Spa announced today the installation of two electric vehicle charging stations, known as connectors, as part of the Tesla Destination Charging Program. The Abbey is now host to one connector specifically for use with Tesla vehicles and one universal connector for use with any electric vehicle. The Abbey Resort was selected by Tesla to participate in its Destination Charging program, which aims to enable electric vehicle charging at high-quality destinations across the country. As electric vehicle charging stations are still a new, unique amenity, Tesla owners often select their travel destinations based on charging availability. The program is designed to broaden electric vehicle owners’ options while encouraging business at selected partner destinations such as The Abbey Resort. Spa, dining, and overnight guests are now welcome to use either the Tesla or universal connector at The Abbey Resort free of additional charge. The Abbey Resort and Avani Spa today announced the public launch of its app and the unveiling of its new website, both designed to provide guests with a positive customer service experience from their very first encounter with the resort. The app allows guests to navigate the resort via online map, view activities and events, make reservations, stay current on dining, spa, and overnight specials, and more. The new, mobile-friendly website features improved visuals, simpler site navigation, and a more user-friendly booking process. The online upgrades follow major renovations to the property in excess of $50 million, which began in 2013 to celebrate the resort’s 50th anniversary of operation. The three-year project included renovations to guest room lounge areas; meeting spaces; the 35,000 square-foot Avani Spa; the resort’s two restaurants, two bars, and coffee shop; the exterior, iconic A-frame; enhancements to the entryway and lobby including the resurfacing of the stone fireplace, and; a new monument sign that welcomes and draws guests in from the moment they arrive. Located just 80 miles from downtown Chicago and 50 miles from Milwaukee, The Abbey Resort and Avani Spa is a treasured icon and the only full-service resort on the shores of Lake Geneva. The resort celebrated its 50th Anniversary in 2013 with the completion of a multi-million dollar renovation of the exterior, meeting space and common areas. The resort boasts a breathtaking setting on 90 acres of beautifully manicured grounds, award-winning dining and banquet facilities, nearby championship golf courses and a wide range of outdoor activities. This only scratches the surface of all the activities and offerings The Abbey Resort provides. With impeccable customer service, the team at The Abbey Resort consistently meets the needs and expectations of both guests and meeting planners. The 35,000 square-foot Avani Spa enhances the resort experience with innovative spa treatments and modern luxuries. The Abbey Resort and Avani Spa is managed and operated by Hostmark Hospitality Group of Schaumburg, Ill. For more information or reservations, visit www.theabbeyresort.com, join Abbey Resort and Avani Spa on Facebook https://www.facebook.com/abbeyresort or follow @AbbeyResort on Twitter www.Twitter.com/abbeyresort. FONTANA, Wis. – July 16, 2015 – The Abbey Resort and Avani Spa today announced the completion of the final phase of its multi-million dollar renovation project which began in 2013 to celebrate the resort’s 50th anniversary of operation. As part of the project completion, the resort invites corporate, association, and event planners of all kinds to kick off their heels, loosen their ties, and escape to the shores of Geneva Lake where ideas flow like water, and fresh air, beautiful harbor views, and expansive green spaces turn standard meetings into extraordinary events. Continuing in its tradition of excellence in meetings, this most recent phase of renovations focused on the resort’s meeting space facilities, guest room lounge areas, and a new monument sign that welcomes guests and draws them in from the moment they arrive on the property. In addition to updating the three Marina meeting rooms, renovations included transforming the hallway areas where buildings connect into miniature lobbies with a modern and comfortable vibe. The newly renovated guest lounge and corridor areas now feature new carpet, wallpaper, artwork and furniture and provide ample gathering space for guests and event attendees to use for collaboration and socialization before and after formal events and meetings are scheduled. The multi-phase project also included major renovations of: the 35,000 square-foot Avani Spa; the resort’s two restaurants, two bars, and coffee shop; the exterior, iconic A-frame of the resort, and; enhancements to the entryway and lobby including the resurfacing of the stone fireplace. The Abbey Resort, which boasts 334 luxury guest rooms and suites, 40,000 square feet of flexible indoor/outdoor meeting space, and a team of on-site meeting and event planners, is the ideal venue for group events ranging from association meetings and corporate retreats to social events such as weddings and reunions. With impeccable customer service, the team at The Abbey Resort consistently meets the needs and expectations of both and meeting planners and guests. As one of the few resorts in the Midwest with its own on-site teambuilding staff, The Abbey team is capable of customizing meeting and events to fit each and every group’s objectives. For more information about meetings and events at The Abbey Resort, or to begin a customized booking, please visit http://www.theabbeyresort.com/meetings-events or contact the Group Sales department at 1-800-709-1323. FONTANA, Wis. – June 2, 2015 – Avani Spa and its employees were today recognized for 25 years of partnership with Phytomer, a prestigious line of spa and skincare products based on marine biotechnology, during a celebration hosted by Phytomer at Avani Spa located within The Abbey Resort. All spa employees were invited to attend the event, which included breakfast, special recognition of three long-time employees of Avani Spa, and remarks by Phytomer’s President, Lenette Casper, and regional representative, Shari Kroening. On behalf of Phytomer, Kroening and Casper recognized three long-time employees of Avani Spa for their dedication to serving the guests of The Abbey Resort and clients of Avani Spa. Lisa McLernon, Sarah Stephan, and Mel Pearson of the spa were presented with a beautiful engraved blue vase on behalf of Phytomer as a way for the company to express its gratitude for years of service working with Phytomer products. For details about Avani Spa and available treatments and services offered, please visit http://www.theabbeyresort.com/spa or call 1-800-SPA-1000. FONTANA, Wis. – May 20, 2015 – The Abbey Resort today announced that it has been recognized as a TripAdvisor® Certificate of Excellence Hall of Fame winner. The Certificate of Excellence award celebrates excellence in hospitality and is given only to establishments that consistently achieve great traveller reviews on TripAdvisor. The ‘Hall of Fame’ was created to honor those businesses that have earned a Certificate of Excellence for five consecutive years. Winners include accommodations, eateries and attractions located all over the world that have continually delivered a superior customer experience. For complete details on packages and rates available at The Abbey Resort, or to book a stay, please visit http://www.theabbeyresort.com/ or call 1-800-709-1323. TripAdvisor, Inc. (NASDAQ: TRIP) manages and operates websites under 24 other travel media brands: www.airfarewatchdog.com, www.bookingbuddy.com, www.cruisecritic.com,www.everytrail.com, www.familyvacationcritic.com, www.flipkey.com, www.thefork.com (includingwww.lafourchette.com, www.eltenedor.com, www.iens.nl and www.besttables.com),www.gateguru.com, www.holidaylettings.co.uk, www.holidaywatchdog.com,www.independenttraveler.com, www.jetsetter.com, www.niumba.com, www.onetime.com,www.oyster.com, www.seatguru.com, www.smartertravel.com, www.tingo.com, www.travelpod.com, www.tripbod.com, www.vacationhomerentals.com, www.viator.com, www.virtualtourist.com,and www.kuxun.cn. FONTANA, Wis. – April 16, 2015 – The first annual North American Meetings Industry Day is taking place today, Thursday, April 16, and is being recognized throughout the state of Wisconsin as proclaimed by Governor Scott Walker. In honor of Meetings Industry Day in Wisconsin, The Abbey Resort is pleased to offer a complimentary one-hour welcome reception as well as an evening bonfire featuring s’mores, for new meetings booked during the month of April 2015. Those interested are encouraged to call The Abbey Resort’s group sales department at 1-800-709-1323 and mention Meetings Industry Day to learn more. Offer is valid for new meetings only, and based on availability, a ten-room minimum, and groups must be contracted by April 30, 2015. Additional restrictions may apply. FONTANA, Wis. – February 23, 2015 – The popular online restaurant reservation service OpenTable.com has announced 240° West as a recipient of its 2015 Diners’ Choice awards as a “Best of Lake Geneva” restaurant. Award winners such as 240° West are identified objectively, according to real feedback from diners who booked through the online service, and shared their experience via optional post-meal comments. 240° West opened in the spring of 2014, and has since been serving up a personalized dining experience in a polished, yet casual atmosphere. The menu at 240° West has a contemporary, Midwestern vibe that ranges from sharable small plates packed with flavor, to expected entrees served with a twist so diners of all kinds will find something to satisfy their appetites and delight their taste buds. 240° West, located at 269 Fontana Boulevard, Fontana, Wisconsin inside The Abbey Resort, is open seven days a week for breakfast beginning at 7 a.m. and for dinner beginning at 5:00 p.m. For more information about 240° West, menu details or to reserve a table, please visit www.theabbeyresort.com/dining/lake-geneva-restaurants.aspx or call 1-800-709-1323. Located on the shores of Geneva Lake, 240° West is the perfect place to enjoy a personalized dining experience in a polished, yet casual atmosphere. The menu at 240° West ranges from small plates packed with flavor, to expected, traditional entrees served in a contemporary manner, ensuring diners of all kinds find something to satisfy their appetite and delight their taste buds. The Abbey Resort and Avani Spa is managed and operated by Hostmark Hospitality Group of Schaumburg, Ill. For more information or reservations, visit www.theabbeyresort.com, join Abbey Resort and Avani Spa on Facebook https://www.facebook.com/abbeyresortor follow @AbbeyResort on Twitter www.Twitter.com/abbeyresort. FONTANA, Wis. – February 10, 2015 – According to USA Today, the use of drones is one of the top five trends that were featured at this year’s International Consumer Electronics Show, and one local company is already making good use of drone videography to look forward to the warm summer months to come. The Abbey Resort and Avani Spa has released a promotional video featuring stunning aerial footage of the resort and Lake Geneva. The spot encourages travelers to look forward to the warmth of summer, and the relaxation, adventure, and lasting traditions that await them at The Abbey Resort and Avani Spa. The Abbey Resort and Avani Spa is managed and operated by Hostmark Hospitality Group of Schaumburg, Ill. For more information or reservations, visit http://www.theabbeyresort.com or call 1-800-709-1323, join Abbey Resort and Avani Spa on Facebook https://www.facebook.com/abbeyresort or follow @AbbeyResort on Twitter www.Twitter.com/abbeyresort. FONTANA, Wis. – January 27, 2015 – Wisconsin’s own The Abbey Resort was featured twice during the month of January as a prime destination for winter travel by national publication USA Today. The outdoor skating rink overlooking Abbey Harbor was selected as one of the country’s “silver linings” to winter along with celebrated venues such as the rinks at Rockefeller Center and Yosemite National Park. The full list can be found here. Within less than a week, a second USA Today article included The Abbey Resort as one of “10 Best: Summer beach resorts for winter getaways,” featured among nine other resorts in desirable travel locations such as Nantucket, Mass., Newport, R.I., and Montauk, N.Y. The full list of “10 Best” destinations can be found here. During winter months, The Abbey Resort offers outdoor activities such as skating, hiking and bonfires on-site, with additional activities like snowshoeing, ice-boating, and skiing nearby. Guests looking to get out of the wintery weather can enjoy a meal at one of the resort’s on-site restaurants, be pampered at the Avani Spa and indoor pool atrium, or take part in a wine- or spa-themed weekend. please visit http://www.theabbeyresort.com or call 1-800-709-1323.